CAJLE (Canadian Association for Japanese Language Education) will host an annual conference which will include lectures and workshops by guest speakers, as well as research presentations and a general meeting. The conference provides a great opportunity for participants to exchange information and opinions on Japanese language education and Japanese linguistics. The CAJLE 2017 Annual Conference will take place at the University of Calgary in Calgary, Alberta, on Wednesday, Aug. 16 and Thursday, Aug. 17, 2017. This year's theme is "Diversifying Japanese: Connections between Language Education and Society." To submit a proposal, you must be an active member of CAJLE. The deadline to submit your abstract is Monday, April 10, 2017. Become a member of CAJLE today! For more information on proposal submissions, please consult CAJLE's website. The 7th International Conference of Computer-Assisted System of Teaching and Learning Japanese (CASTEL/J) will be held at Waseda University, Tokyo from August 4 to 6, 2017. We would like to invite those who are actively using technology in their Japanese language teaching and research to present papers at the conference. In addition to paper presentations, we are planning keynote speeches, workshops, sponsor sessions, and others. We hope that many educators and researchers will find that this conference is a great place for interacting with fellow educators and researchers as well as learning new technologies. We look forward to seeing you at Waseda University next summer. CASTEL/J welcomes proposals for individual papers, panel sessions, and poster presentations. We are especially interested in the following topics. You can present in either English or Japanese. Pease write an abstract in the language that you will use in the presentation. Please include the following in your proposal. The Association canadienne des professionnels de l'immersion (ACPI), in collaboration with Université du Monde, has organized a week of courses and cultural activities in Nice, France, from July 31 to Aug. 5, 2017. Spend the day with the company of great names in Canadian Immersion: Renée Bourgoin, Shauna Néro, Danie Boudreau and Caroline Roux. Take the afternoon to explore and discover the wonderful regions of Nice. Please note that you must be an active member of ACPI to sign up. Become a member of ACPI, and sign up for this exciting activity! For more information, consult ACPI's event page. In principle, those who are currently employed by the applying organization as a Japanese-language teacher and who will continue teaching in the aforementioned organization after their return. *If you are a Japanese-language teacher who does not meet the above eligibility requirements but still wishes to participate in this program, please contact Ms. Noriko Saito at nsaito@jftor.org. ​Those who did not complete their compulsory education (elementary & junior high school, 9 years) in Japan. Details: This is a four-day workshop designed for non-native Japanese language teachers, including a one-day workshop open to other teachers on the first day. For the one-day workshop, we are pleased to welcome Ms. Stacia Johnson as our keynote presenter, who will discuss British Columbia's new curriculum. Following this, another session will be led by the Japan Foundation's newly dispatched Japanese Language Specialist, Mr. Yoshifumi Murakami. The remaining three days are an "overnight camp" workshop, focusing on brushing up participants' Japanese skills using the Japan Foundation's textbook, Marugoto. Participants will get to try each level from A1 to B1, and through experiencing the different levels of Marugoto as "students" they will also learn about teaching using Marugoto. There will also be opportunities outside of the brush-up sessions to discuss language education in the 21st century. Schedule: Please click here for the schedule. One-day Workshop: Ms. Johnson's keynote session will be conducted in English and Mr. Murakami's session will be conducted in Japanese (but discussion in English is welcome!). Brush-up sessions: conducted primarily in Japanese. Grant Coverage: JFT will bear the following expenses in accordance with its regulations. Application Procedures: Applications should be submitted via e-mail to Ms. Noriko Saito (nsaito@jftor.org) at the Japan Foundation, Toronto no later than May 22, 2017. 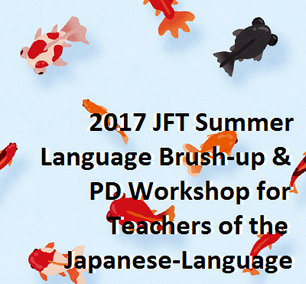 Please visit http://jftor.org/language/teachers/summer_training/2017workshop/ to download the application form. 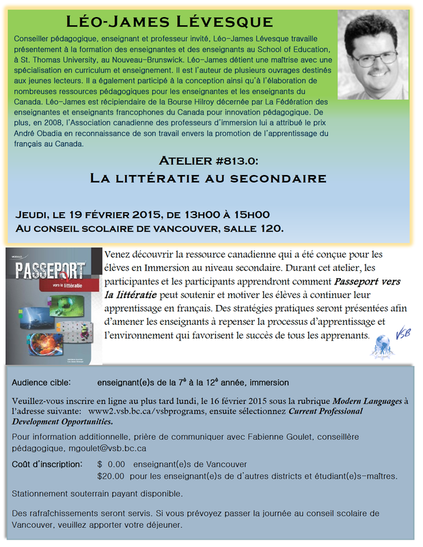 Learn effective strategies to teach French in a meaningful and authentic context - the entire conference is en français! Become certified to teach Intensive French! Based on the Neuro-linguistic Approach (NLA) to develop oral, listening, reading and writing communicative competencies of French learners. Founded on a student-centerer and literacy-based pedagogy emphasizing authentic communication, social interaction and the development of the Core Competencies through project-based learning. 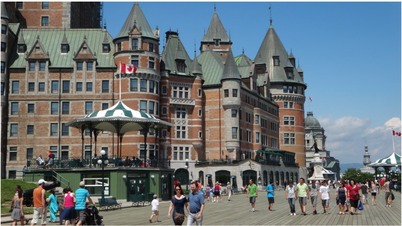 Join UBC Faculty of Education in a nineteen-day non-credit immersion program in the heart of Quebec City. The program is designed to respond to the needs of all French second language teachers, both experienced teachers and those just entering the profession. The program is open to all levels of French second language speakers, from absolute beginner to advanced. The program also welcomes applicants who are not in the teaching profession. Register before April 28, 2017! Develop your oral communication skills as well as an appreciation of Quebec’s unique culture. Morning classes, afternoon workshops and field trips concentrate on improving the participant’s ability to converse in French. There is no prerequisite for the program; previous classroom experience and prior knowledge of French are not required. Funding for BC Teachers is provided by the Department of Canadian Heritage of the Government of Canada. Bursaries for BC teachers are administered by UBC Faculty of Education, for the French Programs Unit of the BC Ministry of Education. Each summer, Continuing Studies at UVic offers bursaries for BC teachers who would like to refresh or improve their French skills by participating in our five-week French immersion program, La Maison Française (LMF). This program will take place at the Sachamama Center for BioCultural Regeneration in Lamas, Peru. The Center is a non-profit organization whose mission is to work collaboratively with the local Kichwa-Lamista communities in their bio-cultural regeneration with the goal of nurturing intercultural dialogue. BCATML is thrilled to work with TPRS experts Michelle Metcalfe and Adriana Ramirez who will lead us in understanding TPRS pedagogy and developing our skills and strategies for use in the classroom. Both Michelle and Adriana will work with smaller groups to give a more individualized and personal focus. You will come away with great new ideas and handouts and meet other teachers just like you! Registration will be limited to only 50 participants. Be sure to register early! The Vancouver Latin American Film Festival invites you to bring your students to a special private screening of the award-winning Guatemalan film Ixcanul (2015). Ixcanul is a spellbinding depiction of daily life in the heart of a Kaqchikel Mayan community in the Guatemalan highlands. Seventeen-year-old Maria lives with her parents near a coffee plantation at the base of an active volcano. As the date of her arranged marriage approaches, she feels increasingly torn between the bonds of tradition and family and her own desire to see what lies on the other side of the mountain. Ancient rituals, ancestral beliefs and the hectic urban world all meet in this splendid and moving story of a young woman’s contradictory desires both to shape her own future and to fulfill the wishes of her community. IXCANUL won the Youth Choice Award at last year's festival and follows the story of a young Kaqchikel Mayan woman in Guatemala. It touches on themes of women's rights and traditions of arranged marriages, reproductive rights and access to health care, and the question of leaving one's rural Indigenous community for opportunities elsewhere. A free energy resource for K-12 teachers called the Classroom Energy Diet Challenge is now available. This program helps students learn the fundamentals of saving energy through interactive challenges, video projects and community engagement. Registration is open now and the contest runs from January 30 to April 26, 2017. For more information on the challenge and to see the complete rules and regulations, please visit energydiet.ca or contact Sandra Black at black@rcgs.org. Be sure to join BC second language teachers as they discuss the current draft curricula for second languages (other than Core French). Use hashtag #BCATML to participate. Q1 In what ways do the curriculum elements (big ideas, curricular competencies, content) work well together? How do they not? Q2 Do the curriculum elements in your language area reflect what is important for all students to learn at each grade level? Q3 Which curriculum elements require greater clarity or more elaborations? Please specify. Q4 How can L2 teachers incorporate Aboriginal perspectives and knowledge into the redesigned curricula? What resources are needed? Q5 What questions, concerns or additional feedback do you have on the second languages draft curricula? Email education@viff.org to reserve your spots. Ann Marie Fleming's Window Horses is a beautifully narrated and colourfully animated story of a young girl's journey toward self-discovery. After being invited to a poetry festival in Shiraz, Iran, by a mysterious figure, Rosie Ming faces challenges and discoveries that ultimately lead to her self-realization. Unaware of the reasons behind her father's disappearance, she has her perspective and conscience awakened by her experiences and the information she uncovers. The first feature-length animation from the NFB to be selected for the festival since Pierre Hébert's La plante humaine, the film features a rich colour palette sure to tantalize the audience. At times, it gives way to guest-animated sequences in which poetic illustration and artistic expression convey the spiritedness of living freely. Window Horses uses poetry, music and illustration to celebrate the value of accepting cultures, opening one's mind and tapping into unknown aspects of the self as a form of self-transformation and spiritual transcendence. The superb voice cast includes festival veterans Don McKellar, Sandra Oh and Ellen Page. Email education@viff.org to book your class in at your convenience. In towns throughout Ontario, there are startling reminders of the colonization of Indigenous territories and the displacement of First Nations people. Anishinaabe comedian and activist Ryan McMahon takes us to his hometown of Fort Frances and down its main drag, which is called Colonization Road. Similar streets have similar names in towns and cities across the province, direct reminders of the Public Lands Act of 1853 and its severe impact on First Nations, their treaties and their land in the name of "Canadian settlement." On his journey through Ontario, McMahon explores the history of these roads, meets with settlers in solidarity and raises significant questions about "reconciliation" and what it means to "decolonize." *Additional High School film titles available here or upon request. The 2017 BCLCA Conference will be held on April 6-7, 2017 at the Manteo Resort in Kelowna with Conference Keynote speaker Jacques Cool from New Brunswick. Cost is $250 for both days. $175 for Thursday, April 6th only. $200 for Friday, April 7th only. Registration is now open. Click here to register now! 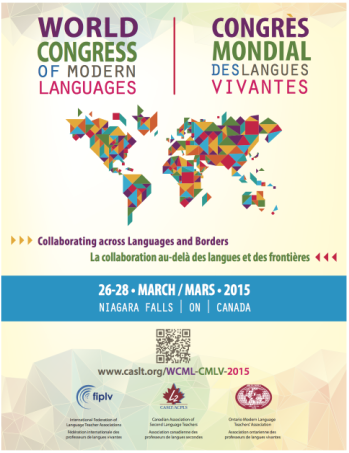 CASLT bi-annual Languages Without Borders Conference for Second Language Educators is now accepting workshop proposals as well as early-bird registration. 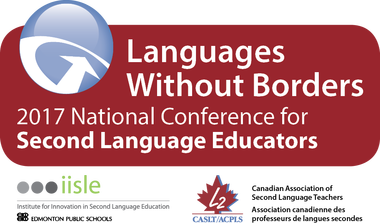 CASLT and the Institute for Innovation in Second Language Education (IISLE), of the Edmonton Public School Board (ESPB), are pleased to announce that the 6th National Conference for Second Languages Teachers "Languages Without Borders" will be held in Edmonton, Alberta, April 6 to 8, 2017. Don't miss out on this great opportunity: register now and submit your ideas for presentations and workshops. See you there! The 2017 Annual Spring Conference of the American Association of Teachers of Japanese (AATJ) will be held in Toronto, Ontario, on Thursday, March 16, 2017, in conjunction with the annual meeting of the Association for Asian Studies. Proposals are invited for individual papers and panels in the following areas/categories: (1) pedagogy, (2) linguistics, (3) literature, (4) second language acquisition, (5) language and technology, and (6) topics related to AATJ’s special interest groups. The deadline for submitting proposals online is October 31, 2016. Please note the addition this year of a new category - language and technology. Registration deadline extended to February 20, 2017 4:30 pm! In a relaxing atmosphere, this Bootcamp FrancoFUN offers a wide range of curriculum-centered, interactive linguistic and cultural activities allowing Core French teachers to practice their French skills, network with colleagues and focus on resources (activities and strategies) for their classrooms. Bootcamp FrancoFUN is organized by the Office of Francophone and Francophile Affairs at Simon Fraser University. Each of BC's new draft curricula has infused Aboriginal ways of knowing along with the First Peoples Principles of Learning. Many teachers may be wondering how to infuse these philosophies into the new curricula. This MOOC (Massive Open Online Course) from UBC will assist teachers in finding resources to supplement their curriculum while at the same time broadening their understanding of Indigenous education not only in Canada - and in particular the BC context - but also the histories and cultures of other Aboriginal peoples around the world. This online course is delivered using the edX platform. To learn more about the particulars and requirements of this 6-week course as well as how to register, click here. Kabuki Theatre, with origins dating back to the 1600s, has remained steeped in tradition while constantly innovating itself. Live productions, featuring some of today’s greatest Kabuki stars, are now being filmed with the highest resolution cameras for screening in cinemas around the world on state-of-the-art digital projection systems and six-channel sound. The Vancouver School Board is hosting its annual Languages Spring Conference. Keynote speakers will be Shane Pointe and Don Fiddler (in English). This event will host a number of workshops for Core French, Intensive French, French Immersion, Japanese, Mandarin and Spanish teachers on a variety of topics including Indigenous perspectives, assessment with the redesigned curriculum, use of technology, communicative strategies, cultural appreciation and more. Registration deadline is Saturday, February 18, 2017. The Great-West Life School Program offers a basic package of activities that are repeated annually. These activities are very well anchored in the history and folklore of the fur trading period and/or are the most in-demand activities. Around this basic package are other related themes and activities presented in rotation every few years, thereby offering greater variety over time. The website offers many free educational resources in both English and French. To switch between English & French, click the language option. 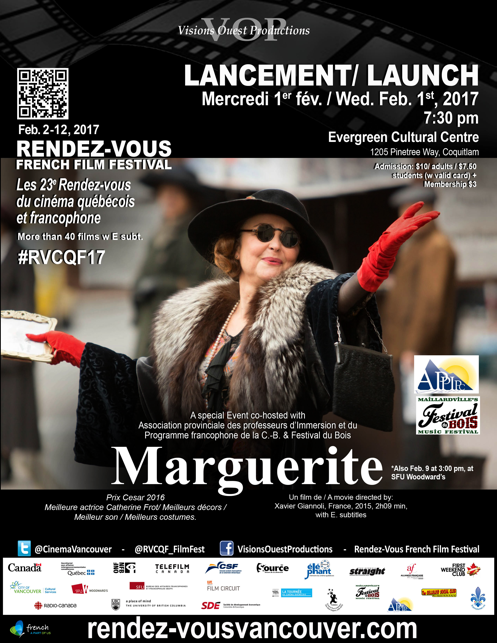 The 23rd Rendez-vous French Film Festival runs from February 2 - 12, 2017 at various locations around the Greater Vancouver area. Visit the official website for full ticket information, listings of movies, schedule of viewings and locations. Dozens of movies that have won several awards will be shown, many of which will be shown with English subtitles. See full listings for details, times and locations. The Japanese Language Proficiency Test is designed to evaluate and certify the language proficiency of learners of the Japanese language. In Canada, the Japanese Language Proficiency Test is offered in Toronto, Edmonton and Vancouver. 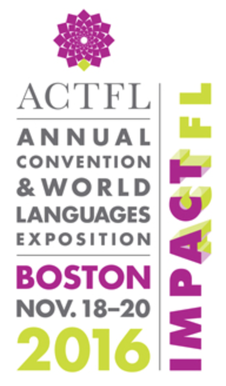 The ACTFL call for proposal submission deadline is fast approaching. Proposals must be received by Wednesday, January 13, 2016 at 11:59 pm ET. Submission guidelines can be found by clicking here. Also, a webinar is available to assist you in submitting your proposal. Please view "Webinar: How to write a successful ACTFL Proposal" by Noriko Fujioka-Ito sensei and Yasuo Takada sensei (2014) at http://www.aatj.org/prodev-webinars. 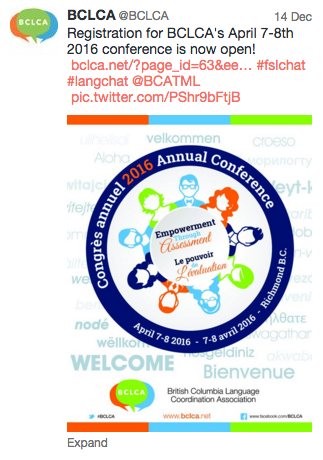 BCATML's annual conference, Celebrating Languages, returns to Burnaby South Secondary School. We are excited to announce Kaleb Child as this year's conference keynote. He will discuss how to imbue Aboriginal ways of knowing and perspectives into your classroom. 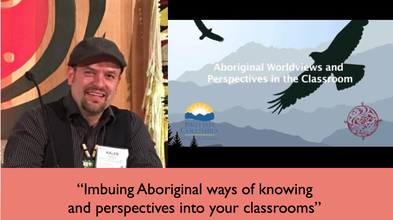 Kaleb will inspire you to develop your curriculum to include First Nations content, perspectives and knowledge in innovating and helpful ways. There will also be a wide range of engaging and relevant workshops for teachers of French, Spanish, German, Japanese, Mandarin and Punjabi. Furthermore, attendees will be to choose from various workshops for all languages and levels. Be prepared to be inspired and motivated to try something new in your classroom this year! Registration fee: Free Clock Hours will be provided. Thank you for your support of Hakuho Foundation Japanese Research Fellowship. for the 12th Hakuho Japanese Research Fellowship. JSAC welcomes conference papers on Japan from a broad range of disciplines - the humanities, arts and social sciences. Submit special panels for the Conference. Subscribe to JSAC for further information. *Note: please ensure that you have received the confirmation letter after your submission. If not, we strongly encourage you resend your documents through the website. If you have specific questions relating to this conference, please contact the Conference Organizers directly on: jsac2016ubc@gmail.com. 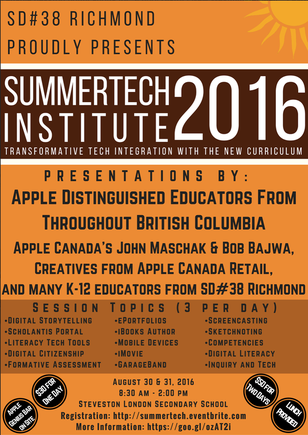 School District #38 Richmond offers SummerTech Institute 2016, their annual technology institute for educators. It is organized and delivered by teachers in the Richmond School District, and will be held at Steveston-London Secondary School on August 30 and August 31, 2016. This year, the organizers are pleased to collaborate with Apple Canada as they will have various Apple Distinguished Educators and Apple Employees presenting, as well as an on-site Apple Genius Bar. The goal of this institute is to share transformative tech integration practices and provide professional development to the staff in the Richmond School District as well as educators from other districts. The cost to attend ranges from $0 - $50. We are pleased to inform you that the online registration for the CAJLE 2016 Annual Conference has started. * Promotional Code for the CAJLE members can be found in the Members Area. The conference, including reception dinner, will take place at Crowne Plaza Fallsview Hotel. Reservation for reception dinner, hotel accommodation (special rate is valid until June 30), shuttle bus to and from Toronto Pearson Airport, and Niagara sightseeing tour is also available now. Please see the following websites. We look forward to welcoming you from all over North America and the world in beautiful Niagara Falls, which also has a symbolic meaning of connecting across borders. We invite submission of abstracts for paper presentations and poster presentations on topics including, but not limited to, Japanese linguistics, Japanese language pedagogy, Japanese as a heritage language, as well as innovative teaching techniques. Submissions related to the conference theme are especially welcome. The allocated time for each presentation is 30 minutes (20 minutes for presentation and 10 minutes for discussion), and posters will be presented in a 90-minute poster session. Presentations may be given in either Japanese, English or French. Individuals may submit only one proposal as presenters or co-presenters. Presenters, including co-presenters, must be members of CAJLE. Non-members will be required to submit a membership application prior to submitting a proposal. Membership information is here. Please submit your proposal via the Online Proposal Submission form in the CAJLE member-only website. To access to the member-only site, please sign in from here. 6) Preference for presentation type: please indicate either “oral presentation preferred” or “poster presentation preferred”. We will accommodate preferences as space allows. We will publish the conference proceedings online (previous issues of the proceedings). Also, selected presentations at the conference will be invited after the conference for submission for Journal CAJLE, Volume 18 (to be published in summer of 2017). These submissions will undergo a separate review process set by the standards of the journal. Étudiez à Nice, en France cet été!! L'Association canadienne des professeurs d'immersion et l'école de langue Azurlingua invitent les enseignantes et enseignants à vivre une semaine de cours et d'activités culturelles sur la côte d'Azur en France. Passez la matinée en compagnie des grands noms de l'immersion canadienne: Roy Lyster, Marie-Josée Morneau, Denis Cousineau et Martine Pellerin. Les participants découvriront les merveilles de la région de Nice pendant les après-midi libres. Il y a la possibilité d'assister aux ateliers d'Azurlingua de midi à 13H15. The Canadian Association of French Immersion Teachers (ACPI) and the Azurlingua Language School invite French speaking teachers to spend a week in the French Riviera partaking in morning classes and culturally rich activities. French Immersion stars Roy Lyster, Marie-Josée Morneau, Denis Cousineau and Martine Pellerin lead morning sessions leaving participants to explore Nice and its wonders during afternoons. There is the opportunity to attend Azurlingua workshops from noon to 1:15 p.m.
Devenir membre de l'ACPI : Voici le lien pour devenir membre de l'ACPI : Formulaire d'adhésion à l'ACPI. Vos dates : La formation de l'ACPI aura lieu la semaine du 01/08/2016 au 06/08/2016. Vous pouvez cependant venir avant ou après cette semaine. Les modules dispensés par l'ACPI le seront uniquement durant la semaine de l'ACPI. Vos modules : Vous pouvez choisir parmis les modules de l'ACPI durant la semaine de l'ACPI. Vous pouvez également assister à des ateliers dispensés par des formateurs exterieur à l'ACPI mais ceci est complètement facultatif. Si vous voulez assiter à des ateliers, il vous suffira le jour de votre arrivée d'en faire la demande. 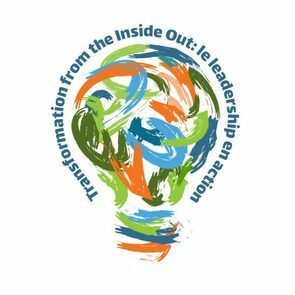 Vos formateurs : La formation sera dispensée par Roy Lyster, Martine Pellerin, Denis Cousineau et Marie-Josée Morneau. It's that time of the year again! Once more, many summer institutes in Intensive French are available across the country. Have a look at those we already announced and check the page often for new ones! You can apply to the B.C. Bursaries for Teachers wishing to work on French-language Professional Development and apply that towards the cost! Take time this summer to enhance your French language skills. Our lively and interactive Summer Institutes focus on the practical application of French through conversation and cultural experiences in a supportive, small-group environment. Full-day courses feature afternoon cultural activities that complement your learning by giving you an opportunity to practise your language skills in real-life contexts. Enjoy excursions and workshops that may include cheese tasting, a UBC farm tour, wine appreciation, croissant making, and celebrations of French holidays. 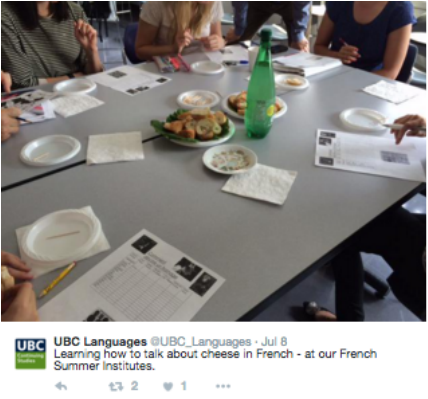 Are you following @UBC_Languages on Twitter? Take a peek and see pictures from past Summer Institute immersive activities! Choose between one-week or three-week programs, mornings only, or full-day courses. Bursaries are available for BC teachers who undertake graduate studies in French, and teachers who have supervised UBC student teachers may use their Tuition Fee Certificates towards this program. Please click here for more information about the 2016 French Summer Institutes at UBC! Learn Spanish in the United States. Visit the only State in America where Spanish is an official language. Instituto Cervantes Albuquerque has designed a unique Spanish language and cultural immersion program for junior and high school groups. This program includes one week of linguistic, cultural and historical immersion for both teacher and interested students. We are now accepting applications for this program! *Those interested in Japanese language education are also welcome to attend. *Support may be available for current Japanese language teachers residing outside of Edmonton. Please see the【Registration for Support】for details. Details: We are pleased to welcome the renowned teacher and winner of the ACTFL 2012 Teacher of the Year - Mr. Yo Azama to be our keynote presenter. Ms. Mami Saito, Japan Foundation Japanese Language Specialist and Japanese-language teachers from Alberta will also lead training and workshop presentations on Japanese Language education and using technology in the classroom. In 2013, Alberta Education produced the "Learning and Technology Policy Framework" (https://education.alberta.ca/learning-with-technology/overview/). In today's rapidly changing world where Internet Technology is quickly advancing, how we use technology in the classroom is becoming more critical. How we use technology in the classroom, what roles teachers can play, how teachers can use technology for classroom activities and learning management, and what kind of "literacy" is needed are all topics and questions that will be addressed during the PD session. *All participants are expected to cover their own cost of meals during the program. Participants who apply through General Registration are asked to cover their own cost for transportation and accommodation during the program. **Those who would like to apply for accommodation support from the Japan Foundation, Toronto are required to submit a separate application form in addition to the general online application (see below). Eligibility: Only teachers who are currently teaching Japanese in Canada and who reside outside Edmonton are eligible. 1. K-12 Teachers of Japanese Language in Alberta can apply for accommodation and transportation support from Alberta Education. Participants interested in applying for 2. are asked to submit the below application form to the Japan Foundation, Toronto by June 7, 2016, in addition to the online application. We continue to invite submissions for presentations on any area of Japanese pedagogy, and those related to the conference theme are especially welcome. Presentations should be a maximum of 30-minutes long with an additional 10 minutes allotted for discussion, in English or Japanese. Please e-mail abstracts in MS Word format with the following information to inishi@uw.edu by March 15, 2016. Please also specify the subject line as "NWCJP Abstract." Notification of acceptance will be sent by April 1, 2016. 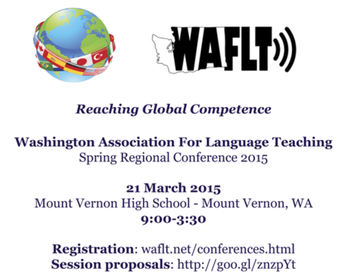 Registration is also available on their website: http://depts.washington.edu/nwjapan/registration.html. Please preregister before May 7 for a reduced fee of $40. 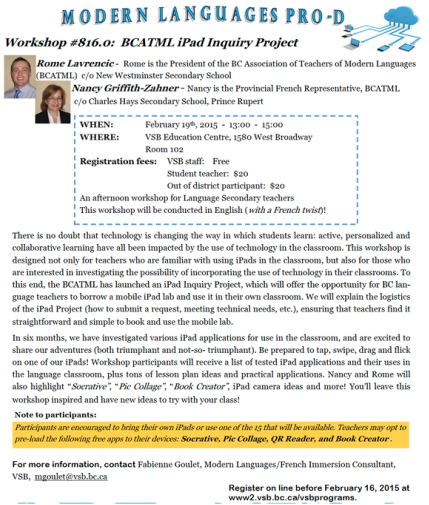 BCAMTL is ecstatic to partner with the Provincial Intermediate and Middle Years Teachers' Association (MyPITA) as well as the BC Teachers of English Language Arts (BCTELA). This tri-PSA collaboration has organized a fantastic spring conference for teachers in beautiful, picturesque Whistler, BC. Do you wish you had more time for your favourite BCATML conference workshops? Maybe you would like to explore the new Core French curriculum further and learn how to develop unit plans, lesson ideas or hands-on activities. Or perhaps, you would like to learn more about the First Peoples Principles of Learning and finding ways to infuse Aboriginal ways of knowing into your curricula. Maybe, you would like to develop your understanding and expertise with using technology in your classroom or you would like to get inspired by developing your writing power. 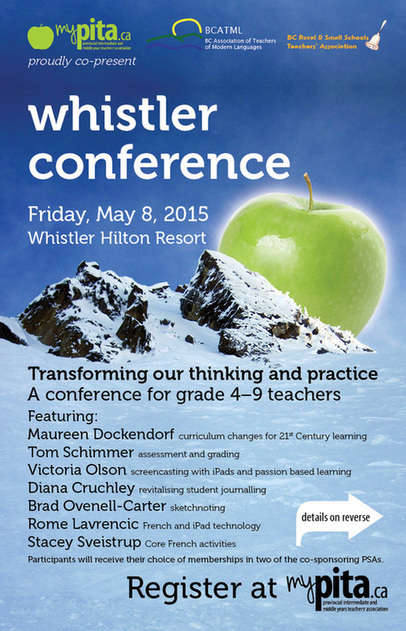 Our Whistler conference has it all! Join us at the Hilton Whistler Resort and Spa for half-day explorations with six exciting and passionate presenters. You will come away with great new ideas and handouts and meet other teachers who share your interests. Full workshop descriptions and presenter information can be found in the conference brochure below. BCTF members: $125 until April 10, $145 starting April 11. Non-BCTF members, out-of-province, and administrators: $145. Planning to join us at Whistler? Need a hotel room for the night? To get the special myPITA room rate at the Whistler Hilton, you need to contact the hotel directly, rather than going through the Hilton’s central reservation service. Contact the In House Reservations team at reservations@hiltonwhistler.com or call 1-800-515-4050. We hope you can join us! If you are interested in attending or discussing these events further, please contact morgaine.jennings@viff.org at your earliest convenience. Great cinema has the power to educate, inspire and foster empathy across cultures. However, getting a chance to see independent films is often a challenge. Year-round, at the Vancity Theatre, we screen some of the world's best cinema and we are thrilled to offer student-focused matinees with flexible booking times. Unless otherwise specified, screenings dates and times are relatively flexible and can be booked any time during the week provided there are no rentals in the theatre and the group size is 50+. 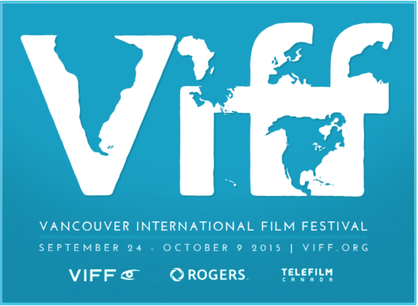 The dates currently listed on the website are for public screenings and does not include the VIFF High screenings. In the event that you do not have 50 students interested in a screening, please send through a couple date requests, and we would be happy to combine you with another school at a time which works well for you both. Tickets are $8/student, and we can offer complimentary tickets for up to 4 teachers and supervisors. Presenter Shannon Bourbonnais will be coming to introduce the “Histoires en Action” programme using the Accelerative Integrated Methodology. Shannon will show how music, drama and gesture can work synergistically to rapidly increase FSL acquisition. The approach is based on stories rather than on themes and allows for greater emotional involvement on the part of the FSL student: moreover, the extensive use of song and drama gives plenty of opportunity for what the presenters refer to as 'pleasant' repetition', an essential ingredient in the development of FSL proficiency. This is a participatory, hands on workshop. Registration is available through https://sd8learns.sd8.bc.ca/ and the cost is $100. Follow the links to April 11 Pro-D.
​Space is limited, so be sure to register soon. Registrations for the 2016 BCLCA conference are now open! C’est sous le thème « Le pouvoir de l’évaluation » que la British Columbia Language CoordinationAssociation (BCLCA) vous invite à son congrès annuel 2016 qui aura lieu au Westin Wall Center de Richmond les 7 et 8 avril 2016. La conférencière est Dr Enrica Piccardo, professeur associé au département du curriculum, de l’enseignement et de l’apprentissage à l’Ontario Institute for Studies in Education de l’Université de Toronto. Merci à Isabelle Côté et à Nicolas Fortin de nous avoir communiqué les infos! 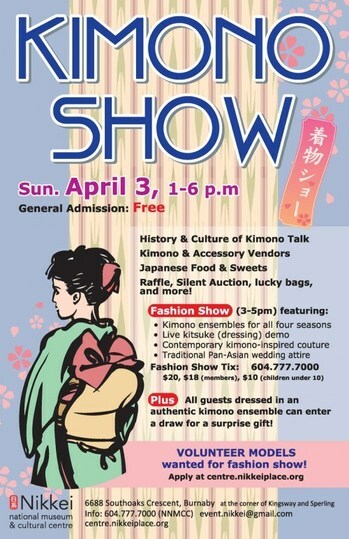 Join the Nikkei Cultural Centre's largest fashion show as they show off the history and culture behind the Japanese Kimono. Inspired by the beauty of the changing seasons, enjoy a beautiful visual display of traditional Japanese clothing and accessories. Have you ever had trouble putting on a Kimono? You’re not alone! Join a seminar to learn the steps and tricks to properly and effortlessly putting on a Kimono. No kimono would be complete without accompanying accessories. They will have several vendors showcasing their unique designs. 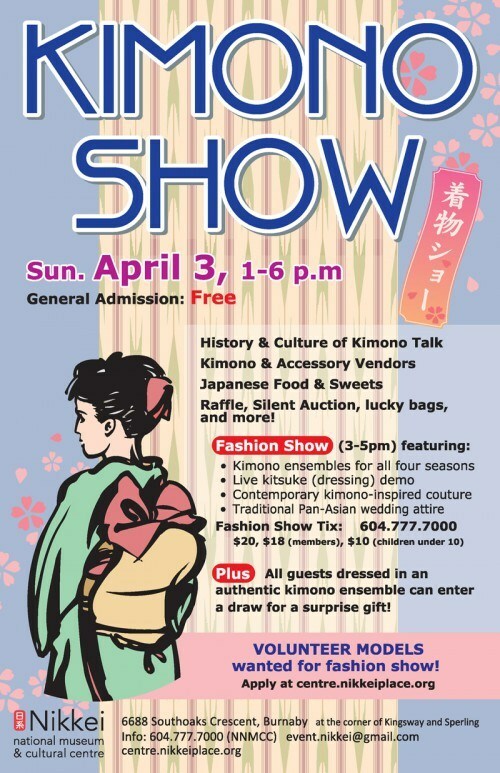 Personalize your Kimono and find accessories that complement your individual sense of style here! Make sure you don’t miss out on the silent auction and raffle draws! Registration is open for the 2016 Annual Spring Conference of the American Association of Teachers of Japanese (AATJ), which will be held in Seattle on Thursday, March 31. Paper and panel presentations will take place at the Seattle Sheraton Hotel from 9:00 a.m. to 5:00 p.m. An evening session, featuring a keynote talk by Professor Laurel Rasplica Rodd and a reception, will take place at the ACT Theatre, located around the corner from the Sheraton. The AATJ Annual Spring Conference will feature almost 100 presentations on various aspects of Japanese language and literature. The conference program is posted online and can be downloaded at http://www.aatj.org/conferences-spring. Online registration for the conference will be open until March 18. Registration fees are $60 for regular AATJ and AJLS members, $40 for student members, and $100 for non-members. After March 18, only on-site registration will be available, in Seattle, at the rate of $100 (cash or check only). Please register online at http://www.aatj.org/conferences-spring. Are you looking for an opportunity? Here is your chance: Scholarships to Spain Embajada de España - Consejería de Educación Tia Tula Scholarships 2016 for teachers of Spanish working in Canada. ​maria.espejo@mecd.es DATE: by March 17th, 2016. We are pleased to invite you to our Online Professional Learning session! This time our moderator will present an introduction to Google Classroom. Are you new to Google Apps for Education (GAFE)? Have you heard of Google Classroom? Discover what it is all about and how you can make use of it for your second language classroom, be it core, intensive or immersion. This session will walk you through the very basics of Google Classroom. We will explore the technical requirements, the initial setup, and the basic features. 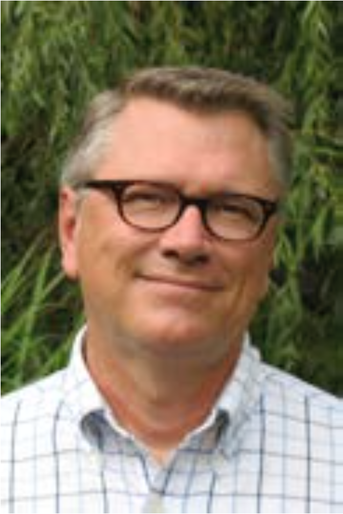 Also, I, Jim Murphy, will show you how to create and share files with students, prepare, grade and return assignments, while sharing best practices and sample activities for your Google Classroom. Don’t miss it: register now to participate. We look forward to seeing you on March 8. Nous avons le plaisir de vous inviter à notre séance de formation professionnelle en ligne! Cette fois, notre animateur, Jim Murphy, vous présentera les bases de Google Classroom. Avez-vous déjà utilisé les Google Apps for Education? Et avez-vous entendu parler de Google Classroom? Découvrez ce dont il s’agit et comment les utiliser dans votre salle de classe de L2, que vous enseigniez en immersion, intensif ou de base. Grâce à cette séance, vous apprendrez les bases de cette application; vous explorerez les différents préalables, le paramétrage et les fonctionnalités importantes. De plus, notre animateur, Jim Murphy, vous expliquera comment créer et partager des fichiers avec les élèves et comment préparer, noter et leur remettre des évaluations. Le tout, en vous initiant aux meilleures pratiques et en partageant des exemples d’activités pour votre Google Classroom. Ne ratez pas votre chance : inscrivez-vous dès maintenant pour participer. 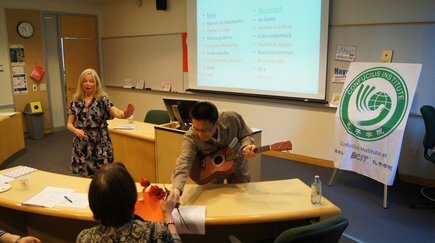 Following the popular workshop in October at the University of British Columbia, the theme is once again "classroom activities." What kind of activities do you conduct? Are the objectives of the activities clear? Is there a "right time" to introduce and conduct activities? Is the explanation comprehensive enough? Is the length of the activities sufficient? At this workshop we will focus on the activities that often take place in day-to-day learning. As a group, we will analyze the contents and types of class activities and think about how to use them in a meaningful way. Once again, teachers in the Greater Victoria area (Saanich, Sooke, Victoria and elsewhere) are invited to register for the French Tapestry Conference. Keynote speaker for this year is Shauna Nero - International Languages Helping Teacher (Surrey) and Executive Member of the BCLCA. 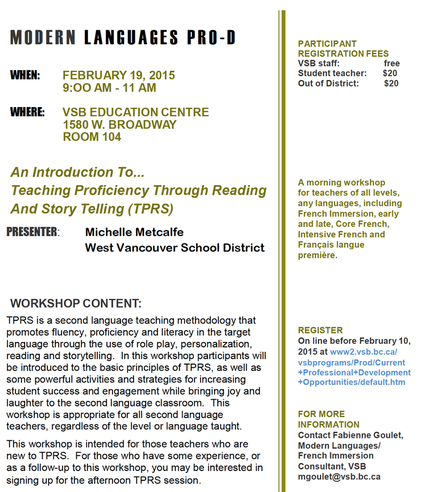 Download the registration form and email it to Solange Goulet (sgoulet@vsb.bc.ca) by January 31. Space is limited! The BC Teachers’ Federation is seeking 10 public school teacher representatives willing to participate as BCTF representatives on the Ministry of Education’s French Resources Development Project Team. The Ministry plans to create a number of videos that would demonstrate how teachers could utilize the redesigned curriculum to create rich learning opportunities for their students. The goals of these videos is to help teachers understand how the redesigned curriculum works as a conceptual, competency-driven model. The videos will provide examples and possibilities of how to use the redesigned curriculum, and be distinct from one another to ensure no single approach is promoted and to demonstrate that there are many ways to approach the curriculum. Team members will develop scenarios for the videos as outlined. The work will consist of attending a three-day meeting in Vancouver in late January 2016 (dates to be determined). Downlown the CV form by clicking here. UBC Faculty of Education is offering a non-credit professional development course titled How Language Works: Success in Literacy and Learning. This course is for educators seeking to extend their prior understandings of language and literacy, including how to apply this knowledge in the classroom. 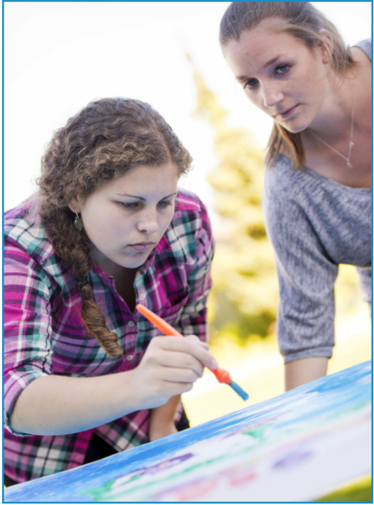 The course begins in February 2016 and will be delivered in the Burnaby School District. Seats are limited and registration is now open. Youth 4 German Cinema contest for students! Youth 4 German Cinema Program The Goethe-Institut’s Step Into German program and the Berlin & Beyond Film Festival are seeking students from across the US, Canada and Mexico (ages 13-18) to participate in the third annual program of Youth 4 German Cinema. This offers the opportunity for young people with an interest in German arts and culture to come to San Francisco and be part of the 20th Berlin & Beyond Film Festival in January 2016. The Award of Excellence is an annual contest dating back to 1991. Every year a short video portrays some aspect of German life and students complete a quiz on the video to win one out of three fantastic stipends for a teenage summer camp in Germany. This is an interesting contest for all Middle and High School students, no German required! Note to BCATML members: Contest ends December 20th, 2015… there's still time to encourage your students to take part! Every year the Japan Foundation, Japanese-Language Institute, Kansai offers a Japanese-language program for specialists in cultural and academic fields. This program is designed to provide specialists (researchers, postgraduate students, librarians, museum curators, etc.) who need a good command of the Japanese language to conduct fieldwork and research through an intensive residential training course on the Japanese-language. 2) Download the application from http://jftor.org/language/jf_programs/ or request a copy to be mailed to you from the Japan Foundation, Toronto. Fill out the application and submit it by December 1, 2015. 3) The application results will be sent to you by mail in April 2016. 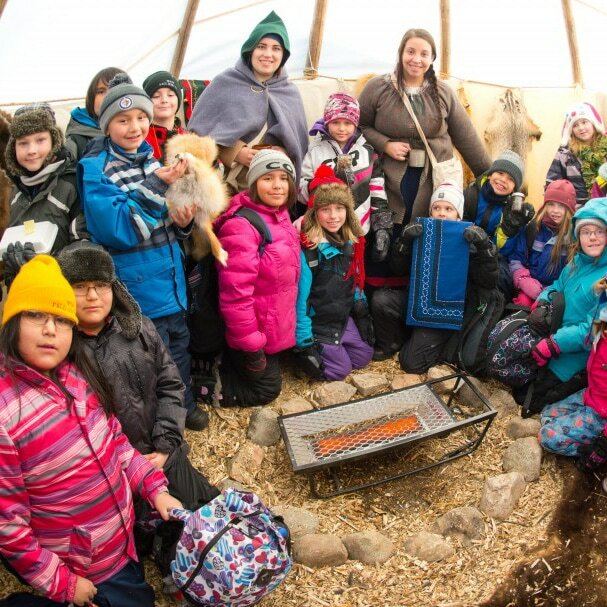 Showcasing innovative curriculum, inspiring people and networking opportunities, the First Nations Education Steering Committee Annual Aboriginal Education Conference draws several hundred educators each year. 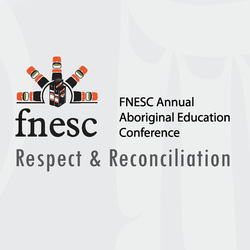 This year's conference theme, Respect and Recognition, references the idea that to achieve quality Aboriginal education means addressing the nature of Aboriginal and non-Aboriginal relationships in Canada and it is inspired by the recommendations of the Royal Commission on Aboriginal Peoples. Dr. Cindy Blackstock will keynote the conference. She is the Executive Director, First Nations Child and Family Caring Society of Canada, Associate Professor, University of Alberta and Director of FNCARES. She has 25 years of social work experience in child protection and Indigenous children’s rights. FlyOver Canada is inviting BC Teachers to join them for their teacher appreciation promotion. 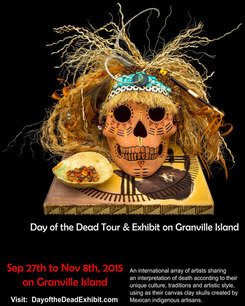 They are offering complimentary admission to all British Columbia elementary and secondary school teachers. 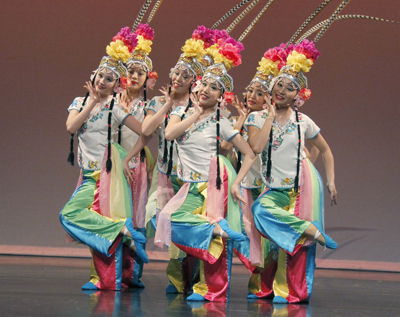 In addition, up to three accompanying persons will receive a 20% admission discount. Full details can be found in the document below. To receive the discounted rate, proof of employment will be required at FlyOver Canada’s guest services desk. Proof of employment may include a business card, school I.D., or other official documentation. Each of BC's new draft curricula has imbued Aboriginal ways of knowing along with the First Peoples Principles of Learning. Many teachers may be wondering how to infuse these philosophies into the new curricula. This MOOC (Massive Open Online Course) from UBC will assist teachers in finding resources to supplement to their curriculum while at the same time broadening their their understanding of Indigenous education not only in Canada - and in particular the BC context - but also the histories and cultures of other Aboriginal peoples around the world. This online course is delivered using the edX platform. To learn more about the particulars and requirements of this 6-week course as well as how to register, click here. It is recommended you watch the introductory video, and read the full description on the course webpage. 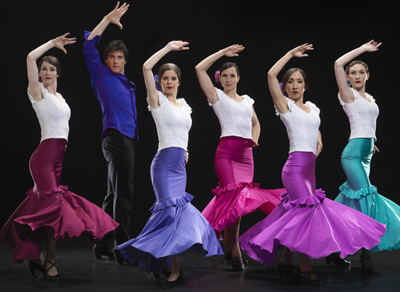 Inspiring, information and fun, The Dance Centre's Discover Dance! series is a great opportunity to sample BC's dance scene. At each show you can see dancers perform, hear the artists talk about their work, ask questions, and sometimes even try a few moves! 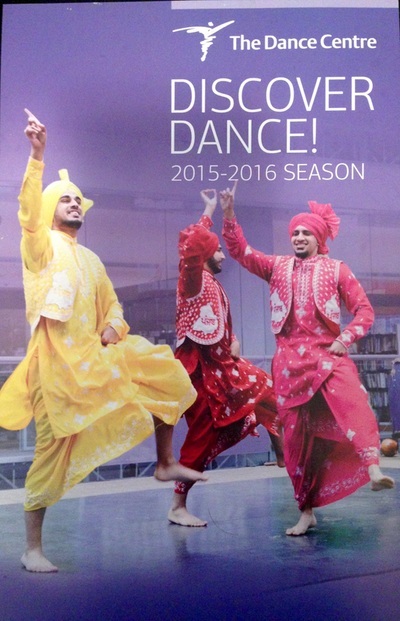 Dynamic hip hop, street dance and bhangra! 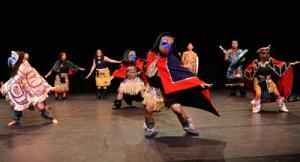 Renowned Northwest Coast First Nations mask dancers. Simon Fraser University hosts a Bootcamp Francofun weekend in a relaxing atmosphere for French teachers of all levels. Cultural and language activities from around the world will be the theme of the weekend which will allow French teachers to practice their French skills, network with colleagues and focus on resources (activities and strategies) for their classrooms. Not sure if your French is up to snuff? Instructions and discussions will be in English, however the activities will be in French. 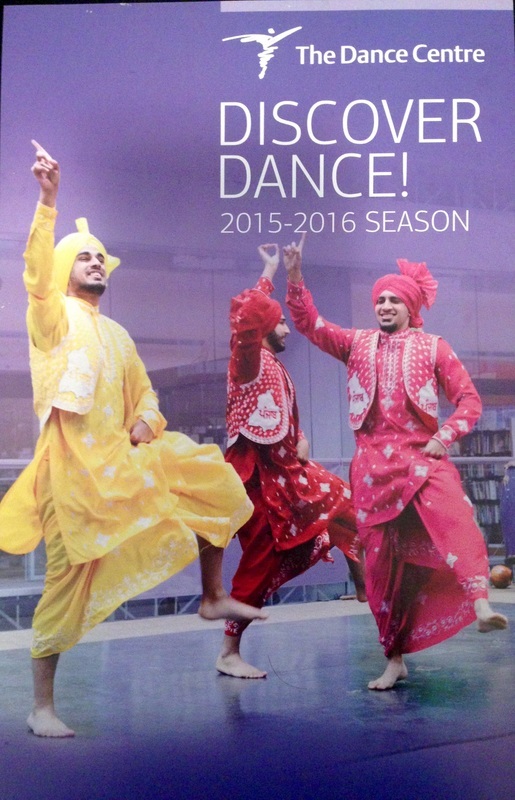 Click here to download the program brochure in either French or English. Registration deadline is October 30, 2015. Cost: $375/person. Includes 2 nights accommodation, meals, activities and resource kit. Beginner level A1: Instructions and discussions in English, activities in French. 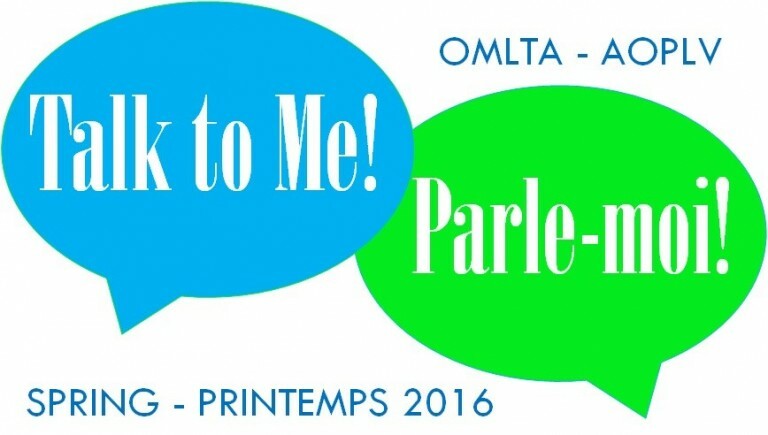 The OMLTA/AOPLV is now accepting proposals for workshops for the 2016 Spring Conference taking place Friday, April 1 to Saturday, April 2 at the International Plaza Hotel (formerly Doubletree) in Toronto! Information can be found by visiting the Spring Conference 2016 page. ​The deadline for submissions is Friday, December 4, 2015. The deadline for submissions is Friday, December 4, 2015. "We encourage workshop proposals from teachers of all levels of experience who are passionate about what they do. You can present in any of the modern languages taught by our members! We look forward to seeing you in April!" UBC is offering a new M.Ed. in Special Education cohort program focusing on Teaching Students with Learning Disabilities in French and French Immersion Programs, beginning January 2016. The program offers a mix of online, face-to-face and blended courses, with face-to-face components delivered in the Burnaby school district, scheduled to meet the needs of working teachers. This cohort program serves a strong community interest for preparation to serve the learning needs among students studying in francophone or French Immersion programs. The focus is learning support and/or special educational services. Courses are delivered using a mix of online, face-to-face and blended courses. The in-person components will be delivered in the Burnaby School District. Students of this program benefit from a diversified learning experience touching on issues in special education, learning disabilities, and, aspects of academic achievement, assessment, and intervention. The entire program targets the francophone and French Immersion student population. Classes are taught in French, in English and sometimes bilingually. This flexible format mimics some of the realities experienced in schools. This program offers a range of courses, from the ones addressing general contents in Special Education to those looking specifically at special topics in learning disabilities and second language acquisition. INFORMATION SESSIONS - Meet program advisors and learn more about applying to become a UBC graduate student. WEDNESDAY, SEPTEMBER 30 | ONLINE SESSION4:00-5:30 p.m.
RSVP to receive login details. THURSDAY, OCTOBER 1 | VANCOUVER4:00-5:30 p.m.
THURSDAY, OCTOBER 8 | VANCOUVER4:00-5:30 p.m. 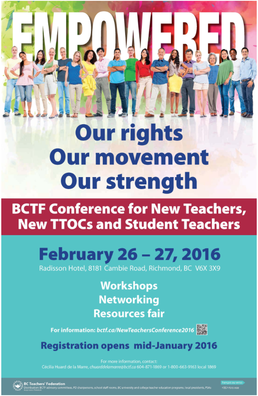 The BCTF will host its 18th New Teachers’ Conference at the Radisson President Hotel and Suites, 8181 Cambie Road, Richmond on Friday February 26 and Saturday February 27, 2016 from 8:30 a.m to 4 p.m. The conference is a professional development opportunity designed specifically for teachers and teachers teaching on call in their first five years of teaching. Student teachers are also invited. The call for workshop proposals is now open until October 23, 2015. If you are interested in facilitating newer teachers to the profession and are interested in offering a 2-hour long workshop, complete the online proposal form by clicking here. Topics which are of high interest to new teachers are: Aboriginal education, Boundary issues in teacher-student relationships, Classroom management, Communication with parents, Curriculum related topics, ELL, French (Core, Immersion, Intensive, Francophone), Mentoring, Literacy and media literacy, Reporting, Assessment, Performance Standards, Health and safety issues, Social justice, Special needs students, Work/Life balance, Technology, Arts, and BC's new curricula. 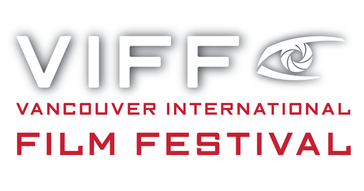 The Vancouver International Film Festival has begun! VIFF is able to offer a special group rate of $8 per student as part of the High School Outreach Program for weekday matinee screenings, as well as a complimentary ticket for the teacher and another adult chaperone. To book tickets for your students, download the fillable PDF Registration Form (save the form and email julia.cooper@viff.org). Please note that pre-registration and payment is required for each order and all tickets are non-refundable. Conference registration, please click here. SD38 SummerTech Institute is the Richmond School District's annual technology institute for educators. It is organized and delivered by teachers in the Richmond School District, and will be held at Westwind Elementary School on Thursday, Sept. 3, 2015. The goal of this institute is to share transformative tech integration practices and provide professional development to the staff in the Richmond School District as well as educators from other districts. Join us for a great day of learning, conversation and collaboration about all things edtech. Cost is $20 (lunch is included). Click here for registration and workshop descriptions. This is the first joint regional conference for BCATML, My Pita, and Rural & Small Schools PSAs. Click here for program details! Of particular note for second language teachers are sessions led by members of our executive, as this is a jointly organized PSA conference: BCATML Vice-President Stacey Sveistrup will show how to use Intensive French methodologies within your Core French classroom successfully. In the afternoon, BCATML President Rome Lavrencic will conduct a session highlighting BCATML's new iPad Mobile library, and how to use a variety of Apps to deliver your second language curriculum. BCATML Elementary/Middle Years Rep Nicole Jarvis will be at a booth, advertising the BCATML's professional supports for BC Teachers of Modern Languages, and sharing our passion for language teaching! TWO WEEK REMINDER ­ submit your proposals now, only two weeks to go! This residential three-week (19 days) program is designed specifically for teachers, June 29 - July 17. Offered in a private college, le Collège Mérici, situated in the historic setting of les Plaines d’Abraham, it gives participants the opportunity to enjoy a park-like setting while being just minutes away from la vieille ville. Bursaries are still available for BC teachers! Click here to learn more about this unique Professional Development opportunity. The program brochure and poster are downloadable: click the files below. CAJLE (Canadian Association for Japanese Language Education) holds an annual conference which includes lectures and workshops by guest speakers, as well as research presentations and a general meeting. The conference provides a great opportunity for participants to exchange information and opinions on Japanese language education and Japanese linguistics. 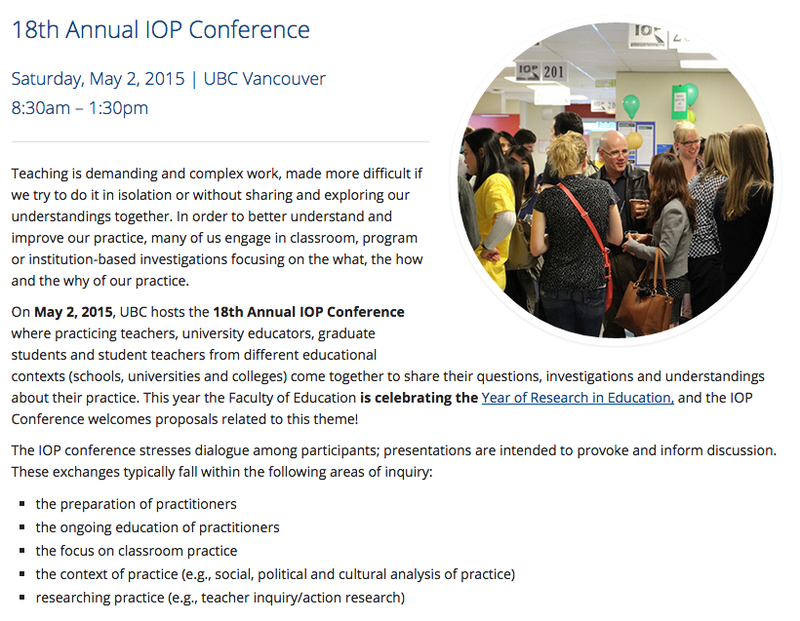 The CAJLE 2015 Annual Conference will take place in Vancouver, British Columbia. We invite submission of abstracts for paper presentations and poster presentations on topics including, but not limited to, Japanese linguistics, Japanese language pedagogy, Japanese as a heritage language, as well as innovative teaching techniques. Submissions related to the conference theme are especially welcome. The allocated time for each presentation is 30 minutes (20 minutes for presentation and 10 minutes for discussion), and posters will be presented in a 90-minute poster session. Presentations may be given in either Japanese, English or French. We will publish the conference proceedings online. Please e-mail submissions as attachments in .doc/.docx (Microsoft Word) file format, with the following information to: Presentation-Planning (cajle.presentation@gmail.com). Please specify the subject line as "CAJLE 2015 Proposal." Please name the word file "CAJLE2015_title" (for the "title" part, use the first 10 letters of your English title. Ex. "CAJLE2015_What_is_Lost" for the title of "What is Lost in Translation?"). Your abstract must be in the language of your presentation. After the conference, selected presentations will be invited to submit for a referred publication in Volume 17 of the Journal CAJLE (to be published in summer of 2016). These submissions will undergo a separate review process set by the standards of the journal. 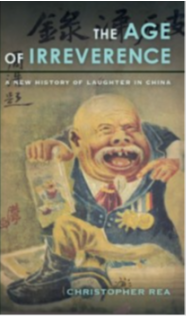 Please see the previously published Proceedings here, and get more detailed information about Journal CAJLE from here. Guidelines for CAJLE Conference Proceedings are here. Click here for program details. Registration is now open! This international conference is the first of its kind with partnerships between the Canadian Association of Second Language Teachers, the Ontario Modern Languages Teachers' Association, and the International Modern Language Teachers' Federation. Click here for registration information which is now open. Visit waflt.net for more details. This Bootcamp FrancoFUN will offer a wide range of curriculum-centered, interactive linguistic and cultural activities allowing Core French teachers to practice their French skills, network with colleagues and focus on resources (activities and strategies) for their classrooms. There will also be an outdoor activity (TBD). 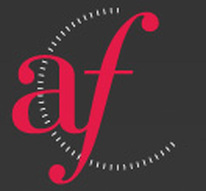 Bootcamp FrancoFUN is jointly organized by the Office of Francophone and Francophile Affairs and the Faculty of Education at Simon Fraser University. Click here for registration details, accommodations and costs. Register before February 10, 2015! Register before February 13, 2015! Participants are encouraged to bring their own iPads, or to use one provided by BCATML. This workshop is for all users, both new and the experienced users. Register before February 16, 2015! 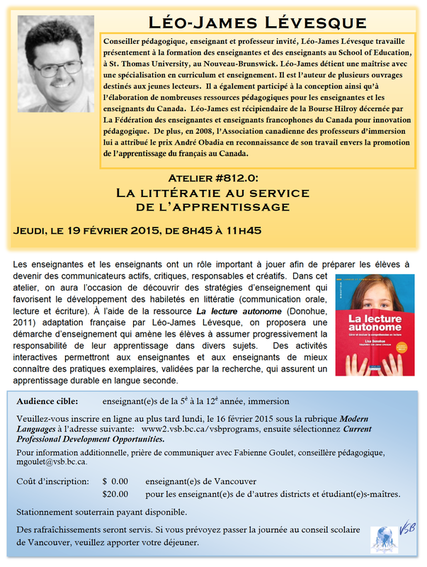 The language consortium of the Greater Victoria area has organized a French one-day conference for the tri-district area. 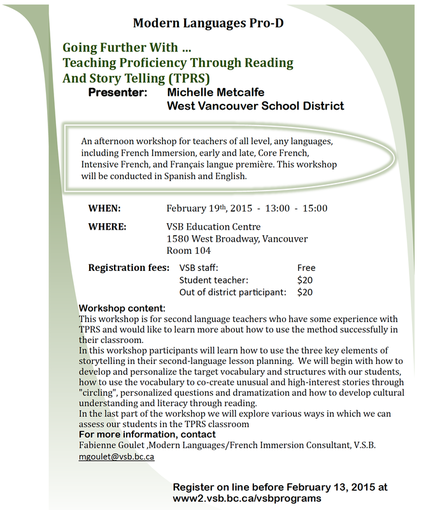 There will be a variety of workshops and presentations for both French Immersion and Core French teachers. Click here to register and learn more information. Of particular interest is the workshop updating the Core French Curriculum Transformation led by Laura Hawkes and Claire Guy. To read some of the highlights from BCATML's last set of meetings with the Ministry, click here or visit our Curriculum Info tab at the top.